Today we were joined by Ivan and Giovanna. For those of you who have read my book, The Way, My Way, you might remember Ivan the Terrible and his Beautiful Wife Giovanna. They helped me find the scenic route into Burgos on the Camino Frances, and we soon became good friends, and walked together many times thereafter to Santiago. 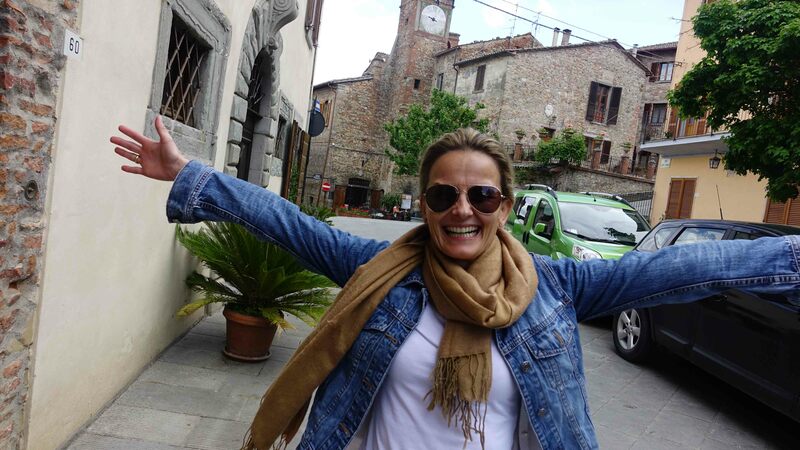 Since then – two years ago now – we have continued to keep in touch, and when Jennifer and I were in Italy last year, they hosted us at their house near Bergamo, in Northern Italy, and we spent a glorious weekend with them as their guests. 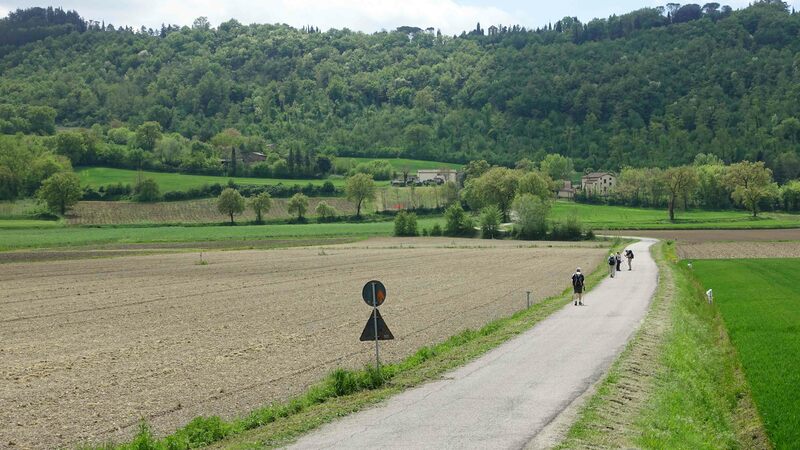 When they heard we were doing the Assisi walk, Ivan contacted me to say that he could only get a few days off work, but he would like to join us and walk a few stages. He finished work late yesterday, and he and Giovanna drove 400kms in horrible holiday traffic (today is May Day, a big holiday in Europe), and this morning they arrived in Sansepulcro to join our group. Ivan and Giovanna are the most delightful people, and immediately they slotted into our group – although many felt they knew them already from my book. They are also very strong walkers, and as we set off I admired the easy relaxed way Ivan walks. And it occurred to me that he relaxes his whole upper body – there’s no tension or effort at all – which gives him an ease of gait which is very difficult to achieve. Also overnight I received on this blog a message from a very wonderful lady whom I’d met on the Camino Frances. Her name is Sigrid, and she and her husband Roland live in a small town in Austria. 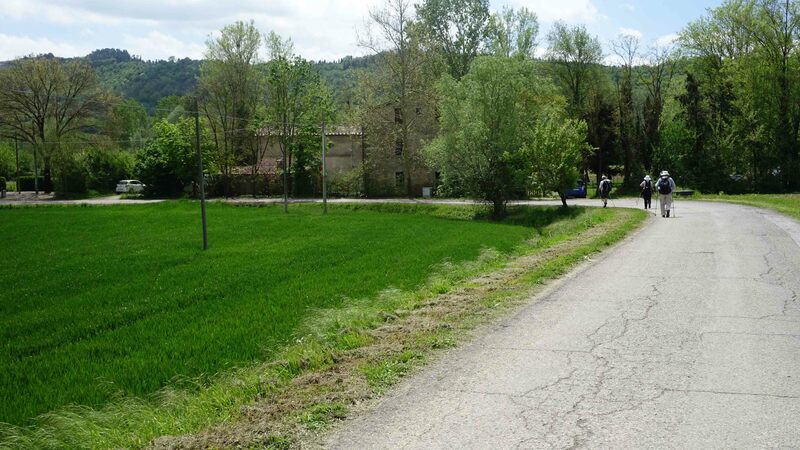 Sigrid and I have remained in loose contact since the Camino – but as it turned out she and Roland were in this part of Italy, and so we made an arrangement to meet for lunch at our end stop today – Citerna. Sigrid and Roland were there to meet us – and Sigrid rushed up to greet me. Just with meeting up with Ivan and Giovanna this morning, these are friendships forged by the intensity of the Camino, and the commonality of beliefs, which transcend boundaries of nationality, gender, and indeed time. 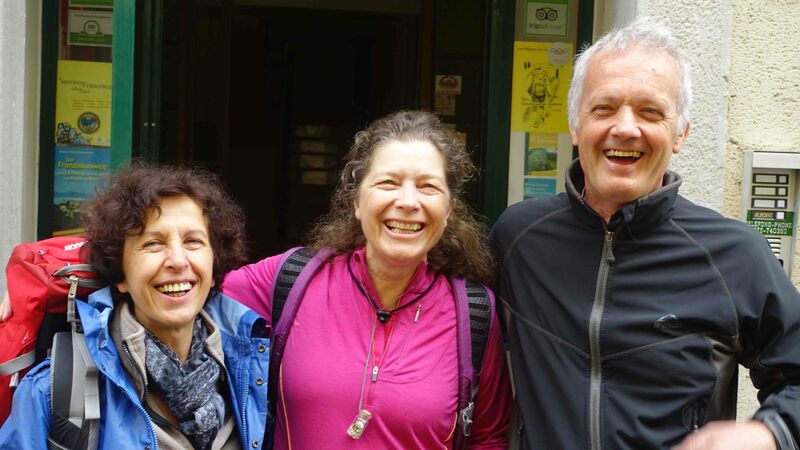 I spent quite a bit of time on the Camino Frances with Ivan and Giovanna, but only a few days with Sigrid. And yet the strength of the bonds are the same. And they will last. Ivan and Giovanna peeled off to rest up while we all had a glorious lunch in a beautiful restaurant with a view out over the surrounding plains and hills. Sigrid and Roland finally had to leave – but I know I will see them again, and perhaps Sigrid on the Camino again – one day very soon. 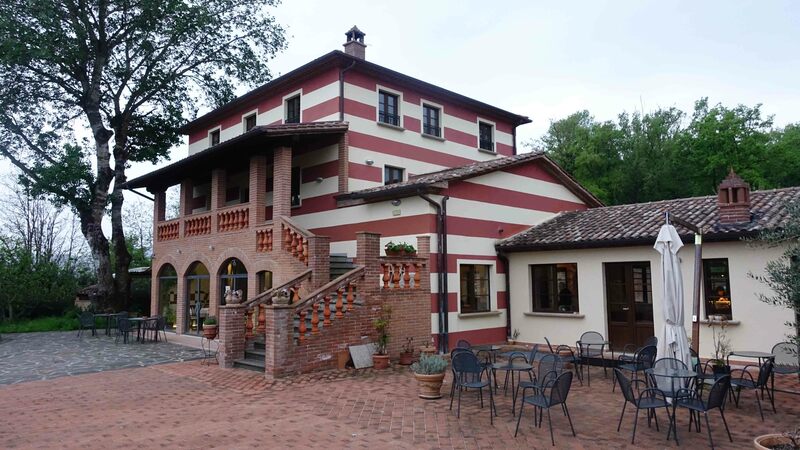 There are no hotels in Citerna – it’s a small picture postcard historic hilltop town – but about 1km down the road is a beautiful Umbrian villa, that is a hotel and restaurant. – handmade tagliatelle pasta with leeks and hazelnuts (beautiful! ), then rolled and grilled pork wrapped in prosciutto, then chocolate mousse with a wild berry sauce – the mousse unlike anything I’ve ever tasted before. It was Ivan and Giovanna’s 40th anniversary when they first met, so we toasted them. They are dear friends and wonderful people. And I will always remember Sigrid’s greeting when we met again today. I’m very fortunate to have such solid friends. Tomorrow begins three days of hard walking. Long distances, and big hills and valleys. I have started to develop a blister on my right heel. It won’t stop me. The spirit of St. Francis is all around us. We can feel it in the churches we visit, in the trails we walk. Jennifer took Marie, Patty and Angela to a very sacred Franciscan monastery at a hilltop town called Montecasale. They didn’t walk the fist leg of the stage today, because of their visit to this monastery. But that’s all part of this pilgrimage. 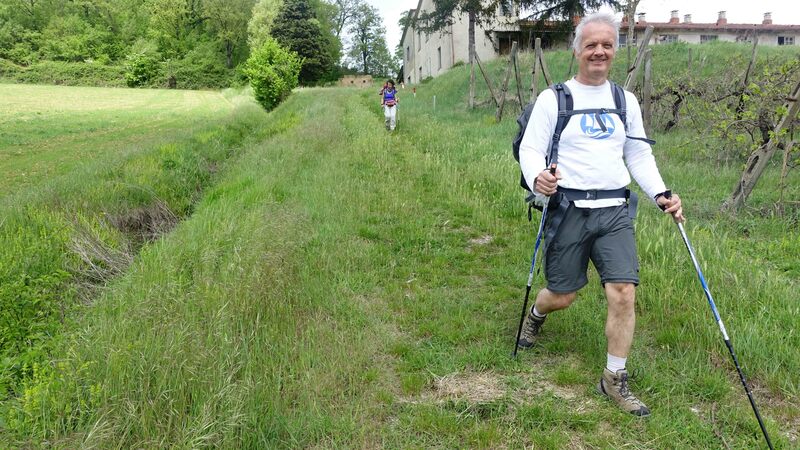 It’s not about walking every kilometre with your backpack – it’s about taking in the spirit of St. Francis. Which is what the ladies did this morning, instead of walking. Wow! What wonderful friends you have made from all around the world! True, lasting friends. The Camino is mighty powerful but I think it has a lot to do with you and Jennifer being such truly beautiful people! What a grand time you are having! Hi Lynda, very lovely of you to say, thank you. Jen and I feel very fortunate to have made the friends we have. And now on this tour we can count Patrician Talbot on that list too, she’s a treat! Camino friends are for life..just us. 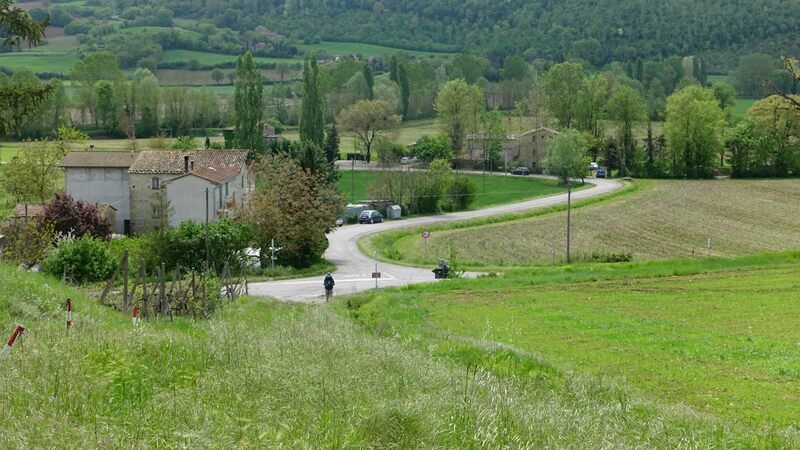 Imagine how excited I am getting to start my Camino… so looking forward to seeing old friends. Wish I was there but can’t wait till India, where more of our Camino family will be acquainted and re-acquainted! In the meantime though I won’t be in Italy, I leave in 2 weeks for Sitges, Spain for a one week adventure of my own. and am so excited. Enjoy, the beauty, the friendship and the familial love! Wish you were here too Jill, but India is coming up fast – and it will be so great to spend time with you again! It’s always great to see Camino buddies. Kathryn and I got to have dinner with our friend Nancy whom I met a few days out of Pamplona. She lives about 20 min away from us. We also got to see a Camino related movie premiere at the Newport Beach film festival. It’s called Life in a Walk and it’s about a father and son walking the Portuguese route together. It’s a great movie with wonderful folks behind it. Beautiful post Bill and equally beautiful photographs. You’re so right about friendships forged by the love of the Camino – there’s something that’s so strong and so precious in that special bond.